We came upon them so quickly I wasn’t ready with my new camera, so the photo isn’t focused properly on the subject. But you can see them hiding there in a mud hole, looking very much like giant clumps of mud, except for the giveaway ears. We see you, Mr Rhinos! …And they saw us. 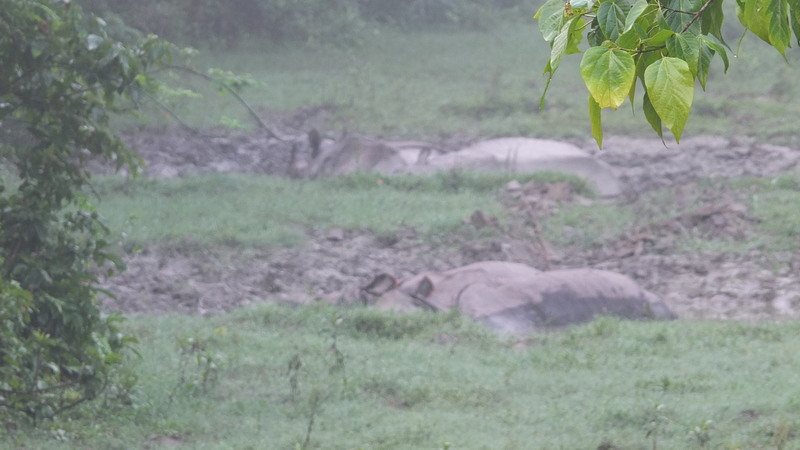 Sitting on an elephant looking down, we watched them take an early morning breakfast bath in the glorious mud. Last night it had rained for the first time in four months, heavy jungle rain that left everything soaked and steaming, and we had lain awake listening to the thunder and lightening the night before. 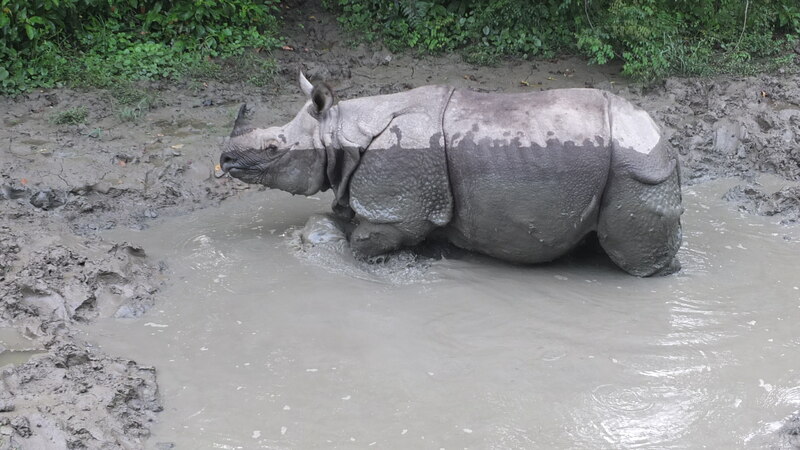 Everything was now so wonderfully cooler, and the rhinos were enjoying what must have been their first mud spa of the season. Not surprisingly they were not too happy about being disturbed, but they weren’t really skittish or aggressive, just a bit put out. It reminded me more of young kids forced out of the backseat of the bus now that the big kids want their seat back. And the big kid was the elephant, not us. Apparently rhinos and elephants get along just fine. They don’t notice us humans freeloading on the elephant’s back. Its all about the elephant, not us, and the rhinos knew to move over so the big guy could take a turn. Sorry guys! We stopped to take a close up and the last rhino posed for the shot. I love his mud stripe! I like that mud stripe too. 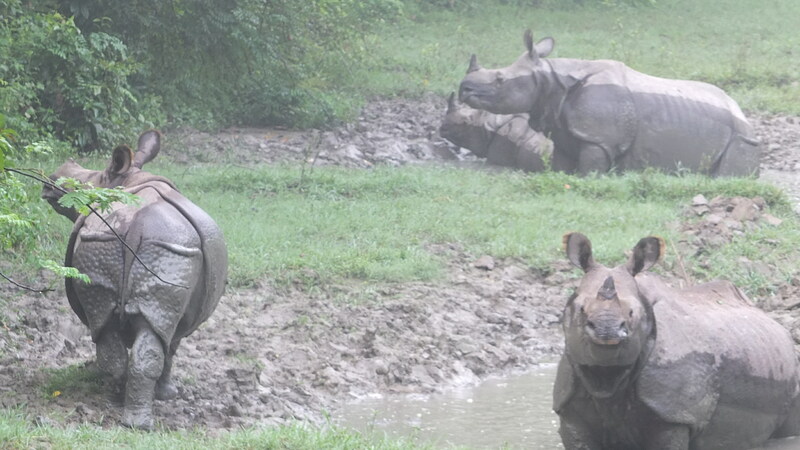 I also went to Chitwan but I took a jeep safari and saw three rhinos. One of them attempted to charge at us twice so our driver sped away each time. I loved that 4 hour jeep drive through the jungle. I did that jeep ride too. It was a great experience. Wow! I had no idea there were rhinos in Nepal. Fab post. Looks like Chitwan National Park is another place to add to the list! Hi. Yes, Chitwan is great. However, there aren’t abundant animals like Africa, as there were a lot of wildlife losses during the Maoist insurgency about ten years ago and also just from poaching and development. But in recent years they’ve managed to stop a great deal of the poaching and protect the forest through community forest programs, and its actually become a template for how other countries could protect their wildlife. Do visit if you can!